Bommarito Exclusive Specials Nissan Certified Used Cars 30 Second Credit App Directions - Take A Test Drive! If you are looking to purchase a new Nissan or used Nissan in the St. Louis area, you’ve just found the largest new and used Nissan inventory within 200 miles! 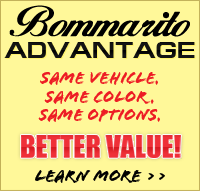 Bommarito Nissan is conveniently located at 661 Dunn Road, Hazelwood, MO 63042. Our professional sales team is committed to a no-pressure, high integrity approach to your ownership experience. Our online inventory of New Nissans and Pre-owned Nissans for sale is updated daily, so please browse our wide selection of all makes and models, then fill out the AutoLink™ form to your right to get started! Bommarito Nissan Pre-owned Superstore offers exclusive 'online only' specials, Nissan Certified Used Cars, Nissan Rebates, Special Financing, and so much more. Contact Bommarito Nissan’s Internet Department at 314-731-2228, or stop by our Nissan Superstore to test drive a new or used Nissan today. Take advantage of Exclusive Deals only at Bommarito Nissan of Hazelwood right now by completing the quick form below. Our team will link you to the pre-owned car, truck, or SUV of your dreams. To succeed as one of the best Nissan dealers in St. Louis year after year, Bommarito Nissan exceeds customer expectations by having expert Nissan Service & Auto Repair. Nissan Certified Professional Technicians get the job done right, the first time! St. Louis, St. Louis County, St. Charles, Chesterfield, Kirkwood, Affton, Webster Groves, Glendale, Rock Hill, Fenton, High Ridge, Imperial, Arnold, House Springs, Festus, Manchester, Ballwin, Ellisville, St. Peters, University City, Creve Coeur, Clayton, Richmond Heights, Rock Hill, Brentwood, Maplewood, Westport, among others.